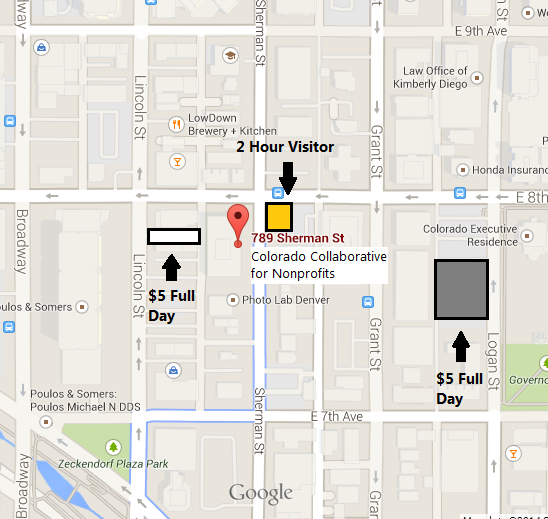 The Collaborative is located at 789 Sherman Street in Denver. We are easily accessible via I-25 off the 6th Ave Exit. For those taking public transportation, we are just off several major intersections including 8th and Lincoln and Speer Boulevard and Broadway. Short Term - There is metered parking on all of the streets around the building, ranging from 2-5 hours. You may also find complimentary 2-hour parking in the Yellow Lot, noted on the map to the bottom right. All-Day – Please park in the White Lot, noted on the map to the bottom right. You have the option to pay cash. There is an additional all day cash lot on Logan between 7th and 8th indicated on the map to the bottom right.